Fayetteville State looked like it might take over the CIAA crown all season, but in the end, Bowie State remained on top of the CIAA. 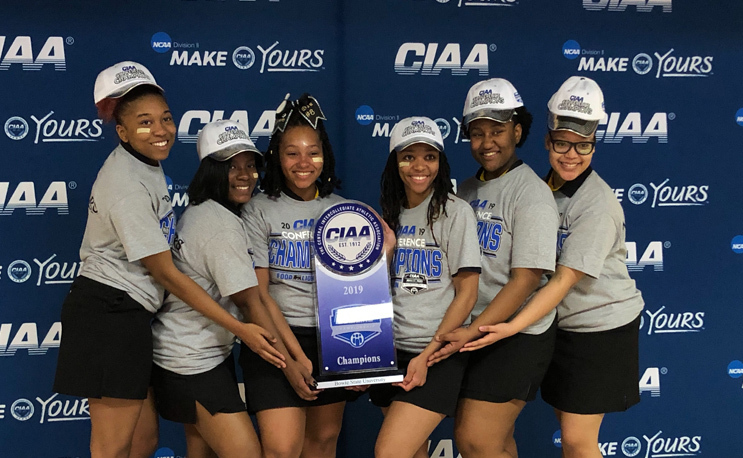 VIRGINIA BEACH, VA—The Bowie State bowling team flirted with disaster on Sunday afternoon but ultimately ran away with its fifth straight championship. Fayetteville State had to play its way out of the loser bracket and started the day on fire. The Broncos raced past Virginia State four games to one before eliminating Virginia Union by the same margin. With ten games under its belt FSU quickly jumped on Bowie winning the first series four games to two. At that point the large Bowie contingent was on edge as it seemed nothing could stop the five ladies from FSU. The loss meant Bowie was on even ground with the Broncos in the double elimination tournament and the next seven games would decide the championship. FSU rode the hot hands of Savannah Starling and Brittany Worthy to win the first two games of the final set. The Broncos were in control of the third game through the eighth frame when Bowie caught fire. Freshman of the year in the CIAA, Cayla Snowden and senior teammate Diamond Carter delivered on pin count. The Bulldogs won the two games 152-136 and 154-147 to even the match at two games apiece. The fifth game was demoralizing for FSU. The Broncos rolled five strikes in a row and seemed to be cruising heading into the tenth frame. The Broncos left the frame open and Diamond Carter capitalized with a strike fest of her own. The extra rolls in the final frame allowed Bowie State to squeeze out a 190-187 win in the game. The Bulldogs finished out the final game with a 191-180 win to seal their fifth straight championship in comeback fashion. Diamond Carter was named the Tournament MVP. Bowie State entered the tournament as a no. 2 seed behind Fayetteville State. Virginia Union placed on the podium as well, a huge accomplishment for the Panthers.